NOW UNIVERSITY OF MARYLAND ALUMNI ARE REWARDED! 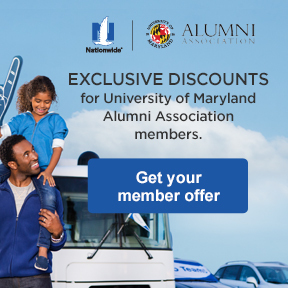 Only Nationwide Insurance® gives University of Maryland Alumni® an exclusive discount on auto insurance. Plus you could save even more when you add features like Vanishing Deductible®*. Get a free quote or call 1-866-633-5747. 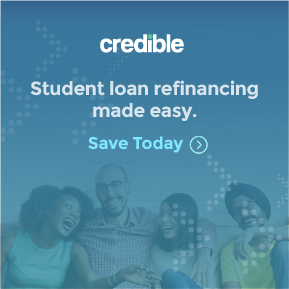 Credible makes it quick and easy for University of Maryland alumni to save on their student loans. The multi-lender marketplace allows borrowers to receive competitive loan offers from its vetted lenders, Borrowers can fill out one form, then receive and compare personalized offers from numerous lenders and choose which best serves their individual needs. Learn more. 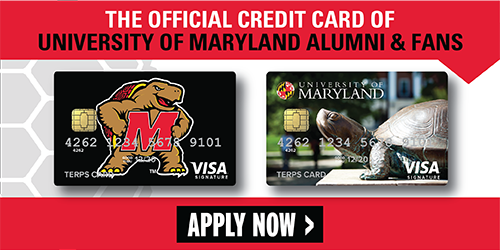 Your Terps VISA® Signature Rewards Card gives you instant access to dozens of benefits in addition to Terp Rewards you earn.